EMOTIONS at CHEER 2017 ran the gamut from cheers to tears as 30 of Malaysia’s best high school and college cheerleading teams gathered to stunt their way into the CHEER hall of fame. The display of talent was awe-inspiring – technically flawless flips, twirls, and tosses abounded – but of the 30, four of the best teams staked their claims as CHEER champions. One of those teams was serial record holder the Cyrens from SM Sri Kuala Lumpur, who clinched the High School All-Girl category’s top spot for a mindblowing eighth time in a row. “I feel great knowing that we’ve achieved our goal – to perform well,” said team captain Cassandra Yang, 17. Support was, as always, the name of the CHEER game. Crowds of supporters showed up at the competition venue, Tropicana City Mall in Petaling Jaya, some as early as 8am to book a good spot, armed with homemade signs, banners, and air horns. With fans that supportive, it’s no wonder the teams were so motivated to perform at their best. And they did: SM Sri Kuala Lumpur’s junior team, Rayvens, managed to reclaim the Junior All-Girl champion’s trophy from SMK Infant Jesus Convent’s Anselm Junior. Last year wasn’t a good year for Rayvens – CHEER 2016 saw one of the biggest upsets of CHEER history when dark horse Anselm Junior managed to wrest the trophy from the then-five time reigning champs. 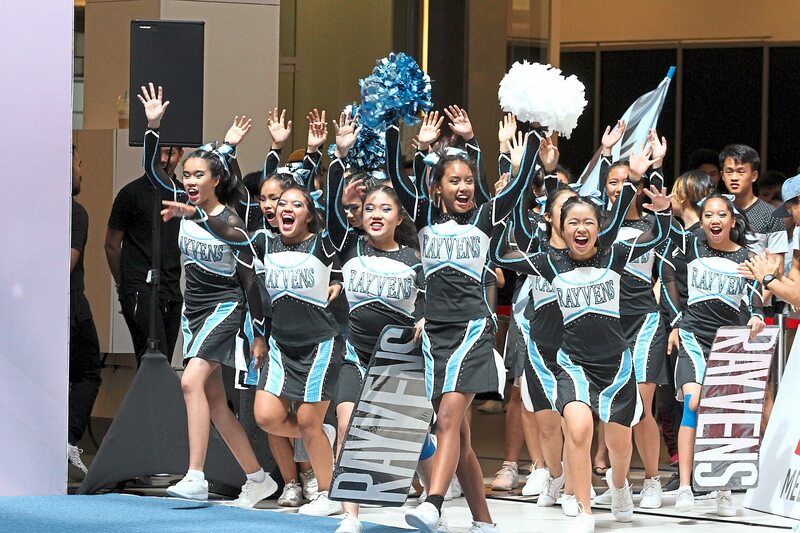 Rayvens fell, literally and in the CHEER charts, to third place. However, instead of being discouraged, they just practised even harder for CHEER 2017. It was a great strategy, as it turns out. “We learnt a lot from failing and it pushed us to try harder stunts and keep practicing until we succeeded – there was no going home if we didn’t succeed,” said Rayvens’ captain Emily Kwa, 15, with a huge smile, as her team’s shrieks of celebration rang out all around her. The young cheerleaders of Ravyens from Sri KL know that it is their time to soar again as they reclaim their status as champions of the High school Junior All-Girls Category. – LOW LAY PHON/The Star. The Junior All-Girl category wasn’t the only one to showcase cheerleading drama. Anticipation was high in the High School Co-Ed category, as Dynamick and long-time rival team Zodiac from SMK Kepong battled it out for the top spot. Unfortunately for team Dynamick, the Zodiacs inched them out by a mere 0.5 points. It was Zodiac’s first win since 2014. “It’s the first time in years that we’ve been able to cheer because we won. I honestly expected Dynamick to win, but I think it’s thanks to the efforts of our coach that the team was able to come together and win,” said exhilarated Zodiac captain, Tai Wei Hang, 17. Team Dynamick didn’t go home empty-handed, either: they won the ONEMUSIC Best Showmanship award. Despite not winning a trophy, they were still glad to be on the blue mat doing what they love best: cheerleading. 1st-runner up for the High school Co-Ed category, Dynamick, entertaining the crowd with their dynamic stunts. – LOW LAY PHON/The Star. “Cheerleading for my school has been an honour and a pleasure for me, and even if we didn’t win the High School Co-Ed title, the team is number one in my heart,” said Dynamick captain Yeong Zhi Yuan, 17. “It’s bittersweet knowing this may be my last time performing at CHEER if I don’t enter one of the universities that takes part, but I am joining the CHARM All-Stars team which competes at the CHARM Cheerleading Championships (C3),” said Yeong. Luckily for cheerleaders like Leong and Yang, leaving high school doesn’t mean the end of their cheerleading careers. Last year, CHEER introduced a brand-new category – the University Co-Ed Elite – that helped take the competition up a notch. More experienced cheerleaders means more intricate moves, and the university teams definitely did not disappoint. Puzzle from Tunku Abdul Rahman University College backflipped their way past their competitors to secure the top spot, beating out last year’s champs, SUC from Sunway University College. “I feel great, as we’ve moved from runners-up last year to become champions this year,” said captain Teow Yueh Tern, 22. The exciting thing about cheerleading is that there are always new teams to look out for and cheer on, like rookie junior team Jazz from the equally new SM Universal Hua Xia. While they failed to place, captain Jo-Ann Yap said she had enjoyed competing and was proud of the team for not falling during the routine. “I was most afraid of messing up the basket toss. During the routine, our goal was to make the audience feel like they wanted to join in,” said Yap, 15. With strong support from both their headmistress and her daughter, former Muriel and CHARM Rebels cheerleader Liew Zhi Jun, the sky’s the limit. “I introduced cheerleading to my mother’s new school because I felt it was a good sport for children to raise their spirits and the name of their school. It’s been five months since we started training, but I think we’ve started out strong,” said Liew, 19, who currently serves as a temporary teacher in the school. Headmistress Chong Siew Lay agreed, adding that students had transferred in from other schools to take part in CHEER. “Our school has been around for less than a year and out of 186 students, 30 of them are cheerleaders. It’s been really exciting even though we have no experience – we only got our uniforms yesterday!” said Chong. It’s both the technical skills displayed in CHEER, as well as the spirit shown by teams like Jazz that gives CHEER head judge Darius Lim Chee Wei hope for the future of Malaysian cheerleading. But he hopes for more than just hitting high standards – he hopes for a chance to Malaysian cheerleaders to prove themselves on a world stage. “I hope to see cheerleading at the Sukma Games in the future,” said Lim, who is also treasurer of the Cheerleading Association and Register of Malaysia (CHARM) and co-founder of cheerleading company Cheer Aspirations. Ng Kok Heng, Group CEO of XOX Berhad was impressed by all the contestants’ teamwork. “What fascinates me is the risky moves and stunts – you’re literally putting your life in your teammate’s hands. If anyone makes a mistake, it’s a team mistake which shows the level of team spirit in cheerleading – it’s a beautiful sport,” said Ng. CHEER was organised by Star Media Group’s youth platform R.AGE and supported by the Youth and Sports Ministry, the Education Ministry and the Cheerleading Association and Registry of Malaysia. A highlight video will be out soon on fb.com/thestarCHEER. XOX Mobile was the event’s Official Partner, with Sunway Education Group as Prize Sponsor, and Tropicana City Mall as Venue Sponsor.